Intelligent toys and smart devices are becoming ubiquitous in children's homes. As such, it is imperative to understand how these computational objects impact children's development. Children's attribution of intelligence relates to how they perceive the behavior of these agents . However, their underlying reasoning is not well understood. To explore this, we invited 30 pairs of children (4-10 years old) and their parents to assess the intelligence of mice, robots, and themselves in a maze-solving activity. Participants watched videos of mice and robots solving a maze. Then, they solved the maze by remotely navigating a robot. Solving the maze enabled participants to gain insight into the agent's mind by referencing their own experience. 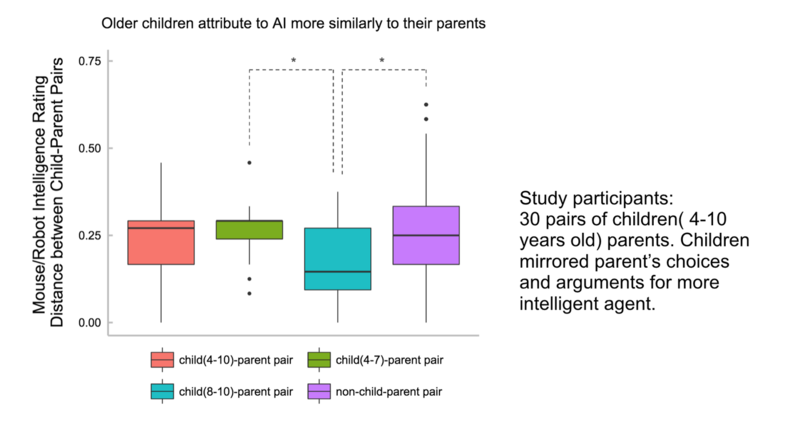 Children and their parents gave similar answers for whether the mouse or the robot was more intelligent and used a wide variety of explanations. We also observed developmental differences in childrens' references to agents' social-emotional attributes, strategies and performance. Randi Williams, Hae Won Park, Lauren Oh, and Cynthia Breazeal. 2019. PopBots: Designing an Artificial Intelligence Curriculum for Early Childhood Education. In Proceedings of the 9th Symposium on Education Advances in Artificial Intelligence (EAAI '19). AAAI, Menlo Park, CA, USA.